Mountain Meadows has never been my favorite topic. It literally makes me sick to my stomach when I read about the slaughter and how the Mormons demanded money for taking care of the orphans. Being in ministry to Mormons, I went and saw September Dawn out of a sense of duty, but normally I would avoid the topic out of queasiness. 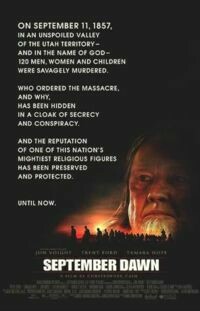 If I was a Mormon I could understand feeling like my people were unduly demonized in the movie. The prayer-juxtaposition between the imprecatory bishop of the Mormons and the kind-hearted pastor of the Fancher-Baker group was too much. I’d like to see some evidence that this kind of rhetoric had a place at the bottom of the Mormon hierarchy. I think that the director and screenwriter overly imposed the real rhetoric of the Mormon reformation spoken at the top onto the lay members. In principle, Brigham’s doctrine of individual blood atonement (built upon the premise that the blood of Christ cannot atone for some sins and that execution for such sins is expiatory) is horrific, and I found it helpful to see it fleshed out for people to see. Mormons still need to face up to what is at least in principle and in teaching a gospel-denying heresy of Brigham Young. But the way Brigham’s doctrine so loosely fell from the mouths of Mormons in interpersonal dialog seemed unrealistic and artificial. A lot of the things (but not all things) Brigham said were historical, but many outsiders (and uninformed Mormons) would probably assume all of it was exaggerated. Another sub-theme was polygamy and how it made for marriages that weren’t between people who had actually fallen in love. The bishop advised one of his sons to take another wife. He already had three. It’s the kind of thing that makes you shudder. While many Mormons would glibly acknowledge the past practice of polygamy and yet mentally disassociate themselves from the thought of it ever having happened among the mainstream group, this needs to be on a movie screen for the ugliness of it to be publicly seen. At another point, the bishop’s son confronts his father over the death of his (the son’s) mother. It is revealed the bishop’s wife was taken by an apostle, and that the bishop acquiesced to it (something not without precedent in Mormonism). When the woman tried to take her children and run away, she was murdered on the principle of individual, expiatory blood atonement, which was again acquiesced to by the bishop. All out of a submission to earthly human priesthood authority leadership above the written word of God. There was one love story between an unmarried Mormon man and a woman from the Christian wagon train. Although unrealistic for obvious reasons, I thought the love story was fun and actually humanized the Mormon people by showing a common ground of young love between the Christian and the Mormon. I think the purpose of this man’s character was to show that not all Mormons were willing to kill such innocent people at the direction of the prophet or other priesthood authority leadership. That Brigham was depicted as ordering the massacre wasn’t as nearly striking to me as the willingness of the lay members to follow what they at least thought were orders from the prophet. Mormonism still needs to deal with these demons today: it fosters a submission to priesthood authority leadership that at major points displaces the commandments and doctrines and moral principles found in the word of God. The best solution to this is to put the authority of the infallible scriptures above fallible human leadership. That either happens via prima scriptura, or even better, sola scriptura, neither of which have been wholly embraced by Mormonism, and neither of which will ever find a place in Mormon theology without some foundational changes to the way people think about the reliability of the Bible and the role of living leadership. The film was obviously on a low budget, so that was a huge disadvantage. It’s unfortunate that some Mormons are focusing on the composite, summary criticism of regular movie critics (who have never studied the Mountain Meadows Massacre) while seemingly acting callous toward the fleshing-out on screen of real events. It was helpful for me to see a depiction of the massacre, of the men so cowardly murdered, of the women and children running and screaming for their lives with traumatic fear. When Joseph scorned the reliability and authority of the Bible, started his adulterous relationships with people like 16-year-old Fanny Alger, and embarked upon some of his quasi-theocratic ambitions, he probably never dreamed that his foundation would bring forth such fruit. Such is the nature of sin. But let us remember that the propensity to commit such sins (including the massacre) is not unique to a religion, but is common to all humanity. While not all are children of the religion of Joseph Smith or Brigham Young, all are children of the sinful Adam, and need the "second Adam," Jesus Christ, to accomplish in our place what we could never accomplish for ourselves.